Sydney throws possibly the best New Year’s Day parties in the world. Head on up the Gold Coast to Byron Bay, the Whitsunday, or the Great Barrier Reef, or indeed anywhere else along the east coast – the good times just keep rolling. January is the best month to visit, after the crowds of December, though the weather is warm and not too hot. Good food, drinks, beaches, private islands, is the best way to start the new year. February is Carnival Time in Venice, which makes it either the very best time to come, or the worst. It seems like a Canaletto painting that comes to life every year when party-goers gather for three weeks of mask celebration. Those seeking the quietness of the floating city will be disappointed as it becomes a place where you join the huddled masses and indulge in another worldly experience. Spain’s Tiny Golden Islands off the coast of North Africa are heavenly in early spring. The days are getting longer and sunnier and there’s no sign of the peak-season crowds. Tenerife is captivated by unexpected lunar landscapes and the unsung Canaries: a whistle-stop tour could take you through Santa Cruz de la Palma’s whitewashed Renaissance palaces, La Gomera’s plunging ravines and Fuencaliente’s sleepy volcanic craters bathed in early morning mist. For a long-haul & guaranteed sunshine, Cuba is a perfect option. April and March are the best months to go to Cuba, weather-wise: when it’s pretty dry, hot-but-not-too-hot (between 19ºC at night and 29ºC in the daytime) and days are long and sunny. Prices, meanwhile, aren’t bad, the holiday traffic long gone. HAVANA is heaven; it is a lovely place, we can’t recommend it enough. Don’t forget to go to the beaches too, for unspoilt Caribbean white sands and turquoise seas, with a Latin beat. A canopy of sunshine and clear skies are your best friends whilst holidaying by the sea! Algarve is renowned for its 365 days of sunshine. It is in the south of Portugal and it provides the best of both worlds as it has a wild party side area as well as a quieter zone by the coast. Worth noting that it has some of the most fantastic beaches in Europe the best water sports, especially surfing. Portuguese food and wine will win your heart, so check out the local restaurants in the Algarve. In May, the weather is heating up but it’s not yet too busy or too hot so this is the best time to visit. Is there anything more magical than the white nights in St Petersburg? For a few weeks around midsummer the sun never sets, illuminating the whole city in an ethereal glow. Russians take off their fur coats as days and nights blur into one and there’s a sense of euphoria in the air. The city puts on a month of festivities, from dancing in the streets to opera and ballet at The Mariinsky, The Conservatoire and The Hermitage Theater. July is the best time to visit the South Pacific islands of Fiji. It’s dry season and the water is at its clearest. The archipelago is one of the best places to dive in the world, surrounded by beautiful reefs which are home to around 1,000 species of fish; but on a clear day, a simple snorkel is just as good. August is a month bookmarked for fun, and a long weekend in Amsterdam will provide you with enough merriment and wild stories to carry you through the winter. Everything is hyped up in the Dutch city; museums are wacky, weird and downright fascinating, and cafés go from loud and lovely to totally laid-back. Mosey around the tourist areas like Jordaan and the old town and head to the seriously cool East Amsterdam, which is packed with kitsch shops, art galleries and delightful people enjoying a Grolsch in one of the cafés’ gardens. It is a surprising fact that it rains more in Milan than in Manchester. Still, never let bad weather stand in the way of a truly splendid city break. Go in September, which has the fewest rainy days of any month in Milan, and an average daytime temperature of 24ºC. Go new-season shopping and do spend money on some excellent boots which will keep your feet dry and make you happy in the cold. Rome by default, becomes our month of choice to visit in October, when it is less busy, still lovely and warm, and you can selfie at the Trevi Fountain in that magic late-summer sunlight without many tourists ruining the view. On New Zealand’s South Island, you can ski in the morning and sunbathe in the afternoon. It’s action-packed, with wild swimming, white-water rafting, glacier hiking, bungee-jumping, sky-diving & horse-riding. On the North Island the hot springs are pure bliss and off the coast of Auckland, some of the most amazing beaches you’ll have ever heard of. Goa is crazy in December. Every palm tree strung with tinsel and fairy lights, every beach bar rocking with the most beautiful happy-go-lucky just-found-themselves travelers dancing night and day. The weather is just perfect, and the parties reach fever pitch. This all rolls into New Year’s Eve celebrations, with parties and raves on the beaches and bars (Goa is India’s most liberal state!). 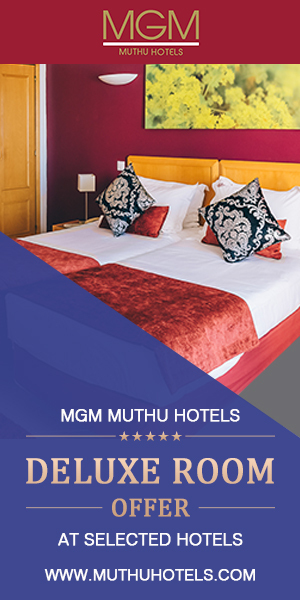 Visit us on Social Media or at http://www.muthuhotels.com and explore our worldwide destinations.